What Can Disney's Aladdin Teach Children About Self-Worth? We all know the enchanting story of Aladdin, the diamond-in-the-rough who captures Princess Jasmine’s heart after a chance encounter at the local market. The Disney live-action remake is coming out this summer. I, for one, can’t wait to watch the loveable ‘desert rat’ as he fights for Jasmine’s heart. But what can the movie teach our children about self-worth? Aladdin is Nipperbout’s theme at all of our childcare events this year. I chose this theme because it holds an important message for children and young people in today’s society. In the story, Aladdin is convinced that the only way that he can be with Jasmine is to pretend that he is ‘Prince Ali’. Aladdin is so used to being called a ‘desert rat’ that he believes he’s worthless. He doesn’t believe that the real version of him deserves Jasmine, despite the yet-unknown fact that he is the only person with a character true enough to touch the lamp, and remove it from the cave. In short, Aladdin believes that he needs to become someone else to be loved when, in reality, the best thing he can be is himself. Do we have a self-worth crisis on our hands? Rates of mental illness amongst children and young people are rising, and one of the biggest areas affecting young peoples’ wellbeing is low self-esteem. Childline has seen an increase of 9% in calls from children suffering from low self-esteem over the past 5 years. The finger of blame has been pointed at various factors including exam pressures, but most of all, at the increased use of social media sites. Are you surprised? Half of all girls with a mental health disorder say they compare themselves to others on social media sites. It can be difficult to know how to talk to children and young people about social media, you risk being told ‘you don’t understand’, or are being ‘over controlling’. How is Nipperbout tackling this? The Aladdin theme is closely linked to our strategy to help our staff, and parents, to recognise the signs and symptoms of anxiety and potential mental health issues. Nipperbout has recently designated a Mental Health Officer (MHO), who will provide mental health support, and guidance, to staff, parents and children, as well as connecting them with useful organisations and resources. We have become increasingly aware of the benefits of mindfulness for people of all ages, which is why we have decided to start using it at Nipperbout. Mindfulness has been shown in many studies to have a very positive effect on mental health and wellbeing. It has been shown to improve attention, reduce stress, increase one's ability to regulate emotions, and feel compassion and empathy – all very valuable things for children to learn. We plan to include mindfulness sessions into the creche timetable so that all children have a chance to relax, breathe and focus inward. As part of the theme, have created ‘Jasmine’s Reflection Balcony’ – a place to take time to reflect, and be alone, in the noise and bustle of our mobile settings. We plan to have scents and battery operated candles, cushions, music and relevant books. Jasmine's Reflection Balcony has already made an appearance at several creches. Our reflection jars will give children a chance to put their feelings, (represented in faces), into the jar before entering, along with how they hope to feel when they come out. Encouraging children to be emotionally self-aware is one of the key factors to maintaining positive mental health and wellbeing in their adult life. We want to encourage this in our settings as much as possible. 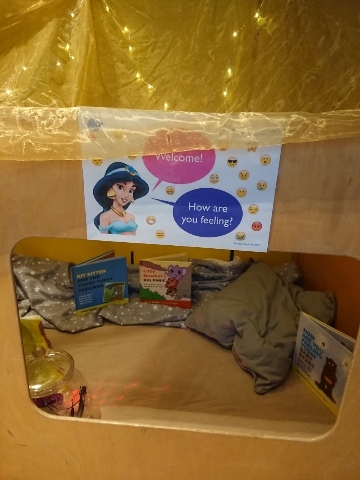 We have begun using story massage in our creches – the practice is an interactive way of combining the creativity of storytelling with the relaxation of a massage. Children sit in a circle and use the rhythm of certain massage strokes to help them tell a story. Numerous studies have shown that the practice of story massage has significant benefits for children including; relaxation, touch tolerance, emotional regulation, increased concentration, better sleep and social connection. These benefits have been especially noted in children with autism. Making sure that we build mental health awareness into everything that we do will be key to Nipperbout moving forward. I’ll be talking more about this in upcoming blogs!